Review snapshot: Waters is currently touring with ‘The Wall Live 2011’, an ambitious and spellbinding performance of the 1979 Pink Floyd epic double-album and film, on a massive visual scale. Flawless sound, a light show that would make the most seasoned stoner wet themselves, and a multimedia extravaganza charged with biting social commentary. If rock is your bag, then this is one show you do not want to miss. Full review: On Monday night Dublin’s O2 Arena played host to one of England’s finest, Roger Waters, ex-bass player / lead singer of rock gods Pink Floyd. 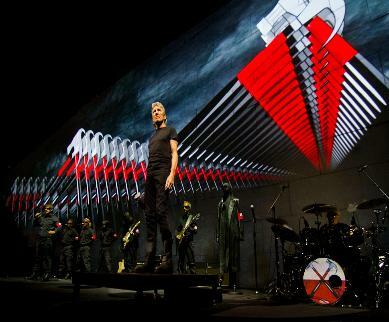 Waters is currently touring with ‘The Wall Live 2011’,an ambitious and spellbinding performance of the 1979 Pink Floyd epic double-album and film, on a massive visual scale. The success lies in the mix of flawless sound, a light show that would make the most seasoned stoner wet themselves, and a multimedia extravaganza charged with biting social commentary. The roaring guitars, roving spotlights and SS-type costume elicited such a frenzy, one could have been forgiven for thinking they had time-travelled to the Nuremberg rally. The opus tells the story of the progression of one man’s psychological isolation and resulting disintegration, at the hands of key figures in his life, such as the terrifying Scottish school master who inspired the anthemic lines ‘Hey! Teacher! Leave us kids alone! / All in all, you’re just another brick in the wall’. Gerard Scarffe’s famous iconic animation and artwork is used to great effect in the stage production, emulating a nightmarish descent into madness. To call this event a concert would be sheer folly. This is an audio-visual feast, underpinned by pertinent themes of the human experience, such as the injustice of war, fear and disunity. (Notably, Waters’ father died in World War II and was the inspiration behind the album). Over the course of the performance a giant wall is constructed and dramatically destroyed on the stage. The wall is used as a canvas to display dramatic images of war and its victims. The only drawback was the partial obscuring of the visuals by large lighting rigs and being victims to unlucky seating arrangements. Waters himself was in relaxed form and traversed the gargantuan stage with ease and age-old rock wisdom. This was not the usual cringe-inducing display of the old-timer refilling his empty coffers: the man has heart and he has a message. Undertaking a tour at two years shy of his seventy years is not only impressive, but a testament to his deep-seated conviction that war is a choice and, ultimately, avoidable. Waters conveys this in a way that avoids patronising his audience and with classic songs that have withstood the test of time. Despite hearing the opening lines ‘Hello, is there anybody in there?’ hundreds of times over my life, ‘Comfortably Numb’ still manages to make the neck hair stand on end. This show has re-invented a classic album as a vehicle for important social truths, which is a tribute to the genius of, not only Roger Waters, but a team of designers that dreamt up the most impressive multimedia spectacle imaginable. Whether or not rock is your bag, this is one show you do not want to miss. 2008 - A comprehensive guide to recording an album, written by Andy Knightly (the guide is spread over 4 parts).